If you shop online or at the mall you are at risk of falling victim to identity theft and at a high risk for theft. It’s important to remember these basic Christmas safety tips and ways for staying safe around the holidays while you are doing your holiday shopping in stores or online. While you might have your eyes set on snagging the next big deal in the store, burglars are looking for ways to break in while you are away and distracted from the home. Similarly, online thieves are out in full force ready to capitalize on the millions of online shoppers who are submitting their private credit card information. Whether you do your shopping online or in the stores, it’s important to remember these basic Christmas safety tips to protect yourself against holiday season. While you’re out standing in line for the stores to open at dawn or home late trying to scoop up every last deal on Black Friday remember to keep in mind these basic Christmas safety tips. Lock everything: This seems obvious, but more often than you would expect a burglar gets into a house just because something was left open or unlocked, especially with house guests visiting who may not have keys. Secure valuables: Never leave anything of value out in plain sight. If you have not already done so, now may be a good time to consider placing any jewelry, extra cash or other valuables in a safe deposit box or even a secure hidden safe within the house. Nothing should ever be visible from any window and the master bedroom is the first room any intruder will check for valuables. Control your social status: Though you might be tempted to broadcast to the world about how excited you are for your holiday travels or Black Friday shopping sprees, resist the urge to broadcast to the whole world that you are not going to be home. Many people cannot seem to wait to let everyone on Facebook or Twitter know that they are about to leave and this is a dangerous thing to share. Leave the light on: Not the most eco-friendly advice, but the more it looks like someone is home, the less likely that someone will try to intrude on your home. Keep the lights on, the Christmas lights lit, and the television on. Anything to signify to potential robbers that someone is home. The home automation and smartphone interactive management tools available from many security systems today allows for you to turn your off and on the lights throughout the day and night to keep up appearances that someone is home. Activate your alarm system: Again, while it may seem obvious, your mind is distracted and you could be in a rush to get out the door. Don’t forget to arm your security system – this simple step will go a long way to protect your home. When in doubt, think like a robber. How would they get in? Does it look like someone is home? Where are your valuables? Use common sense and remember these easy home security tips and ensure your possessions will be safe from harm while you are out doing your Christmas shopping, traveling or partying. Looking for more security tips? Check out how to protect your home while on vacation. Ready to get a great online deal or get your credit card compromised? Approximately 7% of all United States adults have their personal identities stolen or otherwise misused and the average financial loss per person is around $3,500. Don’t let this happen to you while doing your online Christmas shopping on Cyber Monday by investing in identity protection software. Trust us, it’s well worth it! You have insurance for your car, health, home so why not have it to protect yourself from being a victim of identity theft too? The cyber risks are growing daily and you’ve worked too hard to have your money and identity stolen. There are a good many identity theft protection services available that range in their coverage of protection of your personal information. Whether you are looking for a service that will lock down every aspect of your life tighter than Fort Knox or whether you are looking for a service to simply protect your social security number, there are identity protection services to meet your needs. Take a look at our Identity Theft Protection Reviews and our pick for the best of the best to keep you safe, during the holidays and every day. Also be sure to check out our identity theft protection reviews comparison table for an apples-to-apples view. Below are some other holiday related safety tips! Make sure your real tree is not too dry. Dry trees are perfect for catching fire! 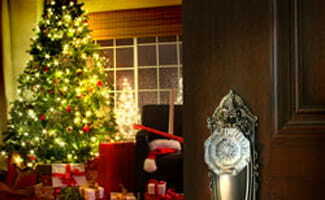 If you have an artificial tree, be sure that it is flame retardant. Water your live tree daily. As a rule of thumb, your tree needs one quart of water for every inch of trunk diameter. Trees should be no closer (and if best farther) than 3 feet from candles, fireplaces, space heaters, radiators, heat vents and other heat sources. Only purchase UL-listed lights and extension cords. If you are decorating outdoors use products that are rated for outdoor use. Before placing your lights (inside or outside) inspect them for any damage that may have occured in storage. Unplug lights before you change bulbs. If you need to get on a ladder to hang lights, try to use a wooden or fiberglass-reinforced plastic one instead of a metal one. Do not connect too many strings of lights together. The general rule is 3, but check with the packaging. Do not overload extension cords or sockets. Check your lights every now and then and make sure the wires are not warm to the touch. Always turn off your lights before going to bed or leaving the house. This is a big one that many of us are guilty of. You spend all that time decorating and you want to show it off. We understand! But we also would hate for you to return home to a fire or wake up to one! Sidewalks get covered with snow and ice throughout winter. It’s important to know when the best time is to clear your sidewalks and what you can do to help prevent more work on yourself! Before it snows apply salt to your sidewalks and driveway. This will help keep it from icing over when it hits the “warmer” sidewalk therefore keeping it from getting more slippery. Don’t shovel until all the snow has fallen. There’s no sense in you spending an hour in the middle of snow fall just to have all of your hard work ruined. Use hand warmers in your boots and gloves when you shovel the snow to keep you warm. When shoveling, lift with your legs not your back. Too many people throw their backs out during the winter months due to improper lifting. Be sure you aren’t putting too much on your shovel and lift it properly. Any other safety tips you have? Let us know below. Happy Holidays and stay safe everyone!